In 1978, Muhammad Ali was the heavy-weight champion of the world, and Superman was about to star in a blockbuster movie. So, what better time to have these 2 super-stars meet? Actually, the book was supposed to come out in the fall of 1977, but we’ll just look past that. This time out, I’m joined once more by Michael Bradley of Thrilling Adventures of Superman in part 1 of our coverage of this Bronze Age classic. Superman in the Bronze Age is a proud member of the Superman Podcast Network and theComics Podcast Network. You may also subscribe to the podcast through iTunes or the RSS Feed, or stream the episode on Stitcher Smart Radio. You can also download the episode directly here. Hi! 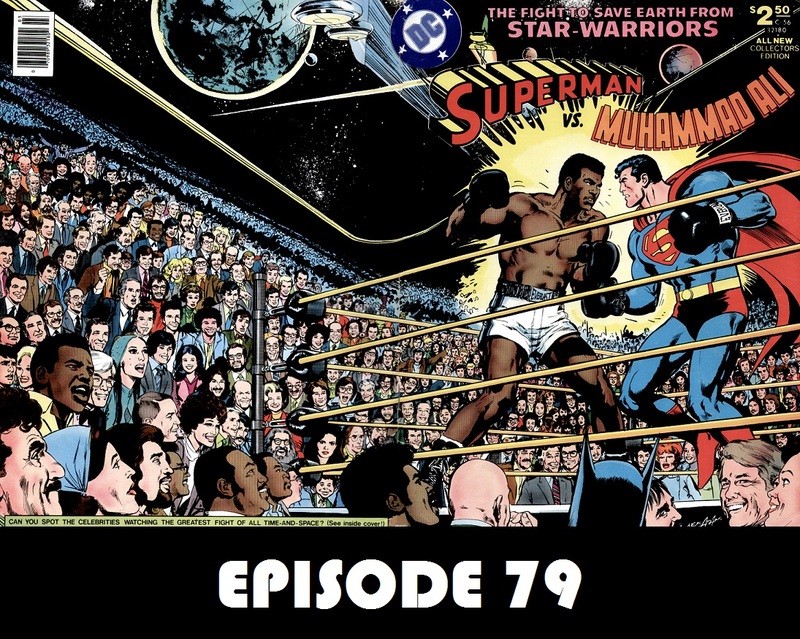 As I write this, only the first part of Superman vs Muhammad Ali has been posted. I’ll probably write again after I listen to part 2, but I just had to comment now. It was great hearing from Michael Bradley again. It’s been too long. (not counting the Man Of Steel roundtable his podcast hosted) I have always enjoyed this comic, which I have in the original tabloid-sized edition. It’s so awesome to look at and that cover…you just can’t say enough about the cover. I was never a huge Muhammad Ali fan, nor of boxing for that matter. But it was very unique to team up Superman with a real-life celebrity and have them in an adventure together. And battling against aliens…WOW! I needed to confess to you how ashamed I am for something. Several emails ago, I mentioned about bringing back the “Favorite” segment back where you asked the listener to write in with their favorite “whatever” for that week (eg. story, team-up, writer, etc) You said you might if we would give you some ideas. It was my suggestion and I still haven’t been any help. I should have kept my mouth shut. Mostly I couldn’t remember what favorites you had already given and didn’t want to repeat them. However, I did think of one. “What is your favorite Superman story involving Kryptonite?” (it’s my question and I’ll still have to think about it) Oh well, I hope you will accept my apology. Now that I have one favorite for you, maybe I can come up with more. Hope all is well. Enjoyed all of the Superman Movie commentaries you did and can’t wait to listen to part 2 of Superman vs Muhammad Ali. Take care!